A few things to straighten out about ancient ships. Yes, still banging on about the Osprey New Vanguard 225 'Republican Roman Warship'. On the principle that bad medicine is better in small doses, here is another teaspoonful. How Big is a Ship ? OR Is that an Almost-Trieres? Plate D of the book has an illustration of a 'hemiolia-trihemiolia'. Said to be based upon a mosaic at the Palazzo Barberini mosaic and the Palazzo Spada stern along with the Lindos stern and the Samothrace prow. The thing that hit me between the eyes was the statement that the ship is 'about 60ft long. 'Sixty feet is about 18 metres! Olympias - a trieres- is 37 metres or so. hmmm. Next the statement that the ship has' 52 oars a side'. He takes a calculation from Morrison ? (which I have never come across) that there were three tiers of oars 26+26+13. ? What ? 26 plus 26 plus 13 is 65. Last time I checked. I think it still is. And..'A quarter double manned '. What ? Next one looks at the illustration and counts laboriously that there are shown..
26 oars in the upper row. 27 in the second row. 13 in the lower half row. Plate D from New Vanguard 225 - This is 60ft long. This is a train wreck of a caption. On wonders if it is the author or the illustrator or both who can take credit. It also shows the woeful standard or absence of any technical editing or proof-reading at Osprey. A hemiolia is a ship with one-and a half men per half-oar-room. The extra half gave extra speed but also allowed 1/3 of the crew to down oars and be ready to fight while the ship could still make way. It probably descended from pirate vessels. 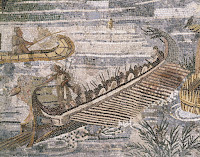 It had almost the speed and agility of a dikrotic vessel but required fewer crewmen (about 50 rowers) and was lighter. The hemiolia had all oarsmen on about the same level, the half-file being inboard in the widest part of the hull. It is possible the mid-half was double-manned instead of them having their own oars. The trihemiolia is a ship with two and a half men per half oar-room. The extra half gave extra speed and allowed 1/5 of the crew to down oars and be ready to fight while the ship could still make way. It probably descended from pirate vessels and was favoured by the Rhodians. It had almost the speed and agility of a trieres but required fewer crewmen (120 rowers or so as opposed to 170 for a trieres). The trihemiolia had oarsmen on three levels as per a trieres but the upper two would be closer vertically than in a trieres. There was no 'hemiolia-trihemiolia'. Just as there was no 'trieres-'tetreres'. The point of the name is that a hemiolia is 'a ship with a half(extra) file of oarsmen. Halfway between a monokrotic and dikrotic pentekonter. A trihemiolia is ' a trieres with a half-file of oarsmen'. Halfway between a dikrotic ship and a trieres. 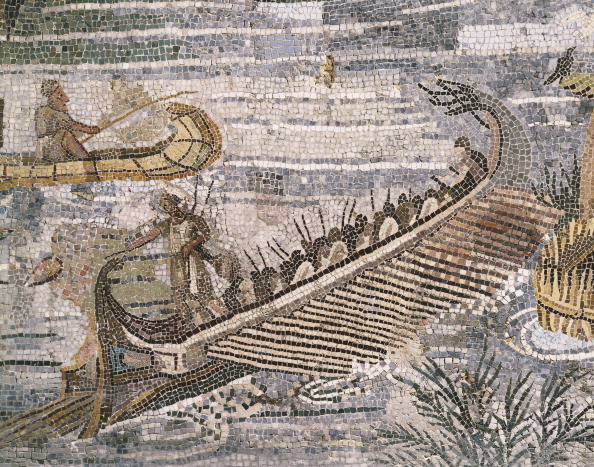 Reconstructing this hybrid ship with oars at two levels is meaningless. If it is a hemiolia it has oarports at two levels - one a half-row- or one, and oarsmen at the same level. If it is a trihemiolia it has oarports at three levels and oarsmen at three levels. Lastly, the number of oars and the length of the ship. Morrison and Coates estimate the oars on a hemiolia at 50 and on a trihemiolia at 120. Rava-D'Amato state there were 130 on their hybrid. And draw it with 132. This gives 132 men in a crew which was trying to save on personnel whereas the trihemiolia had just 120. But wait ! We must add the 'quarter double-manned'. This raises the total of rowers to 162 or 163. A saving of just 7 or 8 men over a trieres, hardly worth it. And length. Here, size is not everything but it is a lot. My initial bugbear is that it is quoted in feet. In a European publication in the 21st century.... It is really easy ,online even,to find the length of a hemiolia at 21metres and a trihemiolia at about 32metres. 60ft is 18 metres. 'Go figure' as they say in their American accents. And the deck is wrong. Oops..
Just found your blog, wish I'd done so sooner as I wouldn't have bought this Osprey ... I was very dissapointed ...! 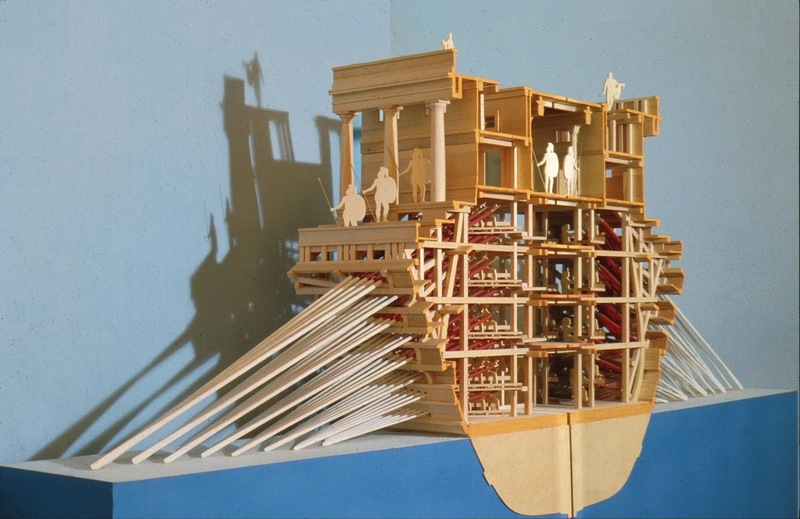 Not sure if you are into modelling, but if you look at the Zvezda Trireme against the Coates Trihemiola plan you should be able to make a decent one by flipping the outer panel of the oarbox and putting a series of Thalamian oarports underneath. Obviously it will need a ventilation course added on deck, but it would make a pretty good one. This is my next project after the Trireme (two Zvezda hulls to get the length, cut down sides, etc.). thanks for the comment. I do model galleys. i have a system for making them simply which i will put into a book soon. The Zvezda model is very nice and your trihemiolia idea is nice. Rhodians and pirates woul dbe a nice scenario for them. Shame 1/72 plastic ships are so pricey. Check my models tags at right. I've been pretty much all through your links :-) , very impressed. Be interested in the book ...! The other problem with 1/72 is that they are so big. I'd like to do a scene with shipsheds and a mole, but in 1/72 scale that's a fair old bit of space. I was looking at your various scale models, and trying to work out what the right balance was to see enough detail, but at the same time get enough space to have it work right. I was toying with 1/300, but haven't convinced myself yet. 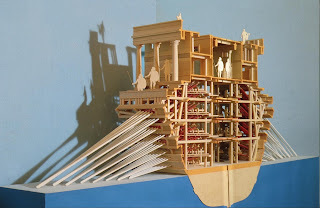 If you are interested I can show my WIP for my Trireme ... ?